Leave it to Sibanye-Stillwater to break ground on the environmental front of the mining industry. In late December, 320 solar panels in two rows were placed just west of the company’s Metallurgical Complex in Columbus. The system will produce 100 kilowatts continuously on a sunny day and an estimated 143,380 kilo-watt hours (kwh) per year. That’s enough to power approximately 13 homes for one year. 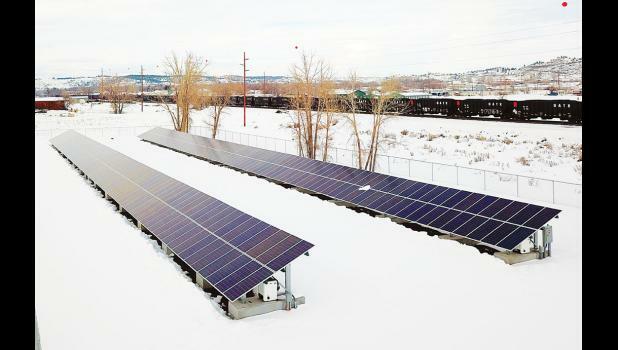 The panels are expected to generate enough power to operate the main office building. With a guaranteed 25-year lifespan and little to no maintenance required, the system will be used to reduce the electrical costs at the smelter and perhaps more importantly, continue the mine’s constant goal of environmental sustainability, said Sibanye-Stillwater Corporate Environmental Manager Randy Weimer. “That’s important to the company,” said Weimer. Each panel measures 38 inches by 77 inches and is built to withstand heavy elements including snow and hail, said Sibanye Stillwater Environmental Compliance Specialist Kevin Mitchum. Each row is 264 feet long and 55 feet apart. Finding the location was the first challenge, said Mitchum, as the company needed to chose a location that it would not likely expand on. The panels can be added to and, if needed, moved, said company electrical engineer Phil Ault. The entire project took approximately a year, with the actual construction taking less than six weeks, said company project manager Heather Morrison. 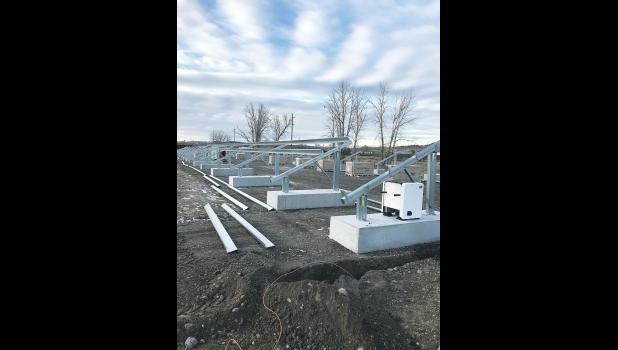 Onsite Energy from Bozeman was the solar contractor and Ace Electric from Laurel handled the electrical installation portion of the project. The price tag for the project was $250,000, with half of that being funded with money that otherwise would have gone to the Universal Systems Benefit Program (USBP). “USBP was designed by the Montana Legislature to support cost-effective energy conservation, low-income customer weatherization, renewable-energy projects and applications, research and development programs related to energy conservation and renewables, market transformation designed to encourage competitive markets for public purpose programs, and low-income energy assistance,” explained Weimer. Since Jan. 1, 1999, all electric utilities (including electric cooperatives) have been required to contribute money generated from a surcharge on customers’ electricity use. Large scale users (such as Sibanye-Stillwater), with a load of more than one megawatt have the option of using what would normally have to be paid to the USBP fund for in-house internal energy programs that meet the qualifications. Sibanye-Stillwater will get a 30 percent federal tax credit due to it being an environmentally efficient project.